Pirates beware, because this new robot can sneak up on you and watch you while you sleep. Pirates - the kind who steal ships that is, not the kind who steal software - may soon be getting a little more attention than they want, thanks to ReconRobotics latest invention: a tiny robot that can climb up the side of the pirates' boats and send video back to the authorities. The spybot, which is still in development, is based on the "Recon Scout" throwbot, a rugged, barbell-sized robot designed to be thrown into difficult or dangerous terrain and scout the area out. The spybot can be fired from a cannon at a pirate ship, whereupon its magnetic wheels will stick to the ship's steel hull, allowing the robot to sneak aboard. The spybot is also equipped with an infrared camera, which allows it to see in complete darkness. 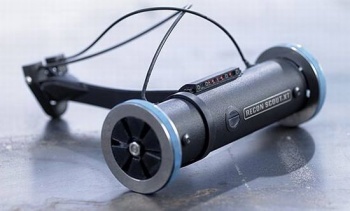 Alan Bignall, president and CEO of ReconRobotics, said that the spybot would help protect the lives of naval personnel and anyone tackling pirates. He also foresaw a future where the platform might be adapted to other uses with different payloads and sensors. It's not hard to think of other applications where a small, camera-equipped robot that can be deployed at a distance might come in handy. Firefighters could use them to scout burning buildings, or soldiers could use them to make sure that an area is safe before they enter it. There are also plenty of non-military/rescue applications, for example, security cameras that can follow people around. On the ceiling. In the dark. Ok, I'm a little creeped out now.